Actress Halle Berry, in 2013, gave $6,800 to the reelection campaign of the California attorney general, an up-and-coming Democrat named Kamala Harris. Jonelle Procope, CEO of the Apollo Theater, pitched in $8,300 a few years later for Harris’s 2016 U.S. Senate campaign and affiliated PACs. Another $2,500 came from former Black Entertainment Television CEO Debra Lee and $4,500 from Crystal McCrary, a film and television producer, who each gave to Harris’s U.S. Senate campaign and an affiliated PAC, respectively. Out of millions given to her various campaigns and PACs, Harris has received significant contributions from black women totaling at least hundreds of thousands, according to an incomplete survey of her election filings. Though there's a shortage of research on black women political donors, a Demos study in 2016 found they are dramatically underrepresented among large contributors, in part due to a racial and gender wealth gap. But black women nevertheless have given big sums to Harris. She not only shares their identity but their values, some large donors said. 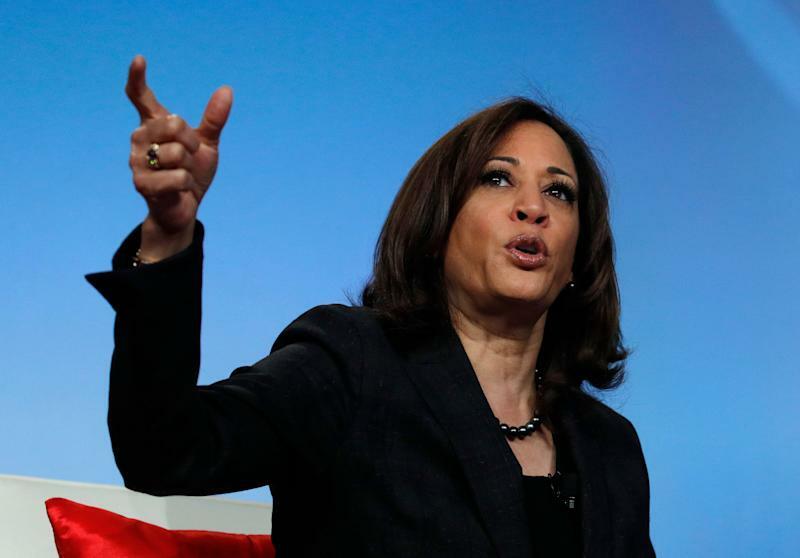 This unsung financial wellspring may help Harris’s 2020 presidential campaign close a fundraising gap for political candidates that, like the wealth gap, disadvantages women of color. Early signs from the Harris campaign suggest she values these potential boosters. In January, following her presidential announcement, Harris made her first remarks at a Columbia, South Carolina, chapter of Alpha Kappa Alpha, the nation’s oldest black sorority. "We stand on the shoulders of women, who were leaders, who 111 years ago said to us we must honor sisterhood and service," Harris, a member of the sorority, reportedly said. 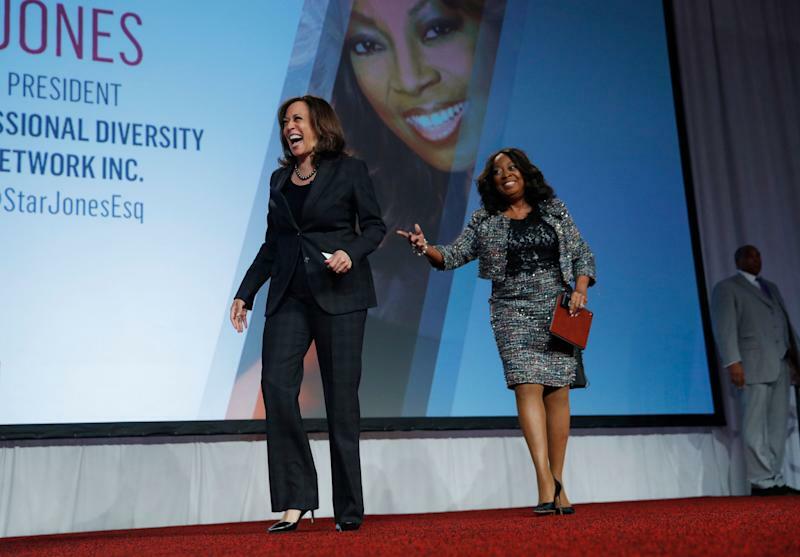 This month, Harris addressed the annual Women of Power Summit, a conference for executive women of color. “You will find many times in your life...that you will be the only woman who looks like you in the room,” she told the audience. To be sure, black women are hardly a top source of campaign funds for Harris. With political roots in California and a legal background, she retains close ties to donors from the film industry and major law firms, which helped her raise over $15 million in her 2016 senate campaign. For instance, Time Warner employees as well as a company-affiliated PAC gave her $127,975 in that race, according to Open Secrets. But in a crowded and hotly contested Democratic primary, large donations from black women can help Harris compete with well-funded opponents. Harris raised $1.5 million in the first 24 hours after her campaign announcement in January—a sizable haul but one later eclipsed by a pair of white male competitors: Vermont Senator Bernie Sanders, who raised $5.9 million in the day after launching his bid last month; and former Texas Congressman Beto O’Rourke, who raised $6.1 million after entering the race last week. Affluent black women are already talking about how best to financially support the Harris campaign, said Leslie Fenwick, a professor and former dean of the Education School at Howard University, Harris’s alma mater. “There’s a substantial enough African American female professional community, with reach, that we can do heavy lifting,” said Fenwick, who gave two donations totaling $5,000 to Harris’s Senate campaign fund and an affiliated PAC in 2017. Fenwick plans to donate to Harris’s presidential campaign, she said. Pointing to organizations likely made up of many black women favorable toward Harris, Fenwick cited Alpha Kappa Alpha as well as Links, Inc., a nationwide service organization of black women. Over 3,000 Alpha Kappa Alpha members reportedly attended the Columbia, South Carolina sorority event at which Harris spoke in January. Months earlier, nearly 300 Links, Inc. members showed up for a membership induction ceremony for Harris, who is the daughter of a Jamaican father and an Indian mother. “Those networks are really powerful,” Fenwick said. Donors can give a maximum of $2,800 to presidential candidates for a given election, as well as $5,000 per year to candidate-affiliated PACs. Data on the political donations of black women is sparse, said Kelly Dittmar, a scholar at the Rutgers University Center for American Women and Politics. But historically, women of all races have been “extremely underrepresented” among all donors above $200, she said. In the 2018 election cycle, women modestly bucked this trend. A week before election day, female donors had accounted for 36% of all contributions to congressional races in the cycle, according to Open Secrets. Over the previous midterm election cycle in 2014, women’s contributions made up just 27% of the money that went to House candidates. In 2018, women donors “were still underrepresented but there was some increase,” Dittmar said. The surge in donations is reflected in a dramatic increase in spending by the Higher Heights for America PAC, an affiliated political action committee that funds black women candidates. The group’s spending leapt 538% between the 2016 and 2018 election cycles, from about $14,500 to $93,000, campaign finance records show. In 2018, an election cycle in which Harris was not up for re-election, she continued to garner large donations from black women, such as $5,000 to her Fearless for the People PAC from Ellen Blair-Chube, a managing director at the global financial services firm William Blair & Company. Mae Whiteside, the CEO of Chicago-based engineering firm CKL Engineers, has given $500 to Harris and $1,000 to the Higher Heights PAC. She said donations can amplify the political influence of black women, who already vote at a high rate.